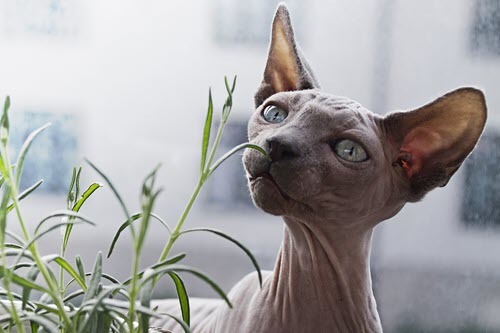 You might think all the shedding your cat does will make it look like this hairless Sphynx breed cat. Shedding is a cat’s natural process of losing dead hair. Outdoor cats may lose more hair in the spring and fall and retain more fur in the winter, while indoor cats can shed all year round. Regularly grooming your cat and vacuuming hair from your house should minimize the inconvenience of shedding. However, if you see bald patches in your cat’s fur or notice a significant loss of hair, the underlying cause may be a health-related problem and should be investigated by a veterinarian. What Would Make a Cat Shed Excessively? If your cat obsessively licks, bites or scratches, if he’s losing patches of hair or stops to scratch or bite the same few spots persistently, then it’s important you take him in for a veterinary exam. There may be a medical, dietary or stress-related issue that needs immediate attention. How Can I Minimize My Cat’s Shedding? What Happens If Shedding goes Untended? If your cat’s shedding is normal, the worst you may end up with is a hairy wardrobe and home-your cat, however, may suffer from hairballs if she isn’t groomed regularly. If her shedding is due to an underlying medical cause, including allergies, parasites, infections or disease, her health may continue to worsen if you don’t seek veterinary care. Additionally, cats who are not groomed appropriately can become matted-this is especially true for long-haired cats. Matted hair can be painful and lead to underlying skin problems. Shedding can be linked to hairballs, too. Read more in our previous article on Cats and Hairballs. If you think your cat is excessively shedding, bring them in to see us. If your cat is unhappy, you will be, too. Let us help you get back on track. You can also find many hairball and cat food choices to get that balanced diet at our FCVC Online Pharmacy.